Glasgow - a city of innovation, always looking forward, but proud of its great past as the power house of the British Empire. Cutting edge architecture and a vibrant cultural and arts scene combine with the warmth and humour of its residents. Scotland’s biggest city and probably biggest personality – no wonder it’s produced characters like Billy Connolly. And what other major cosmopolitan European city has such easy access to fantastic countryside – the lochs and glens are just beyond the suburbs. Through mercantile prowess and the mighty shipyards on the River Clyde, Glasgow amassed wealth and industrial muscle in the Victorian era. 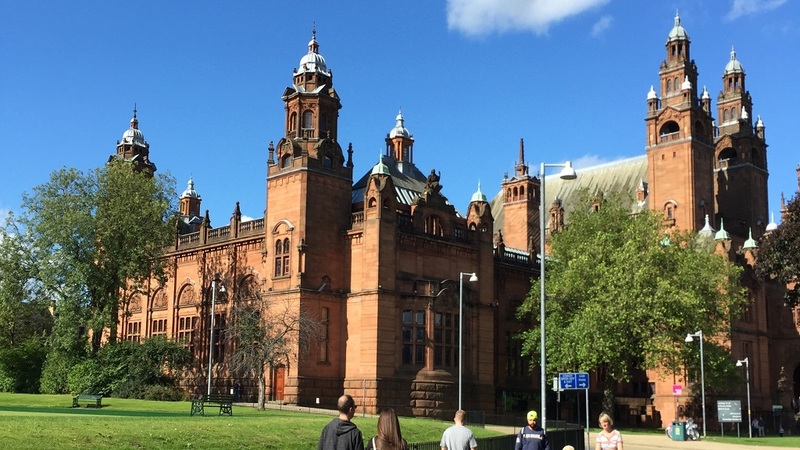 The legacy of that period lives on in the grand architecture of the cityscape, such as imposing Greek Revival works and the scale of the Kelvingrove Museum and University buildings. Always at the forefront of cutting edge design, the city is home to Glasgow School of Art, the Art Nouveau masterpiece of Charles Rennie Mackintosh. The city is dotted with other Mackintosh ‘Glasgow Style’ buildings, such as the House for an Art Lover. His influence was international and still resonates today. Contemporary architecture continues to push boundaries with unique examples in the redeveloped areas down by the River Clyde. The titanium curves of Glasgow Science Centre have been nicknamed the Armadillo, while nearby is the utterly individual Clyde Arc bridge. Culture and the arts loom large in the city and the Kelvingrove Museum and Art Gallery in the West End is the jewel in the crown. This massive palace of art recently underwent a multi million pound makeover. It’s Scotland’s best visited attraction – and it’s free. Other world class art is housed in the Burrell Collection and the University of Glasgow’s Hunterian Museum and Art Gallery. For an absorbing insight into the city’s social history, visit the People’s Palace and take a coffee break in the amazing Winter Gardens. Among the many green spaces to rest awhile is the Glasgow Botanic Gardens with its Victorian glasshouses and woodland walks. There are over 200 arts organisations based in Glasgow, from small independent theatre companies to Scottish Opera, Scottish Ballet and the National Theatre of Scotland. Venues of every size cram the city. Rock, pop, traditional music, stand up comedy, art house cinema – it’s all available. Of course, such a dynamic cultural centre breeds a lively and diverse social scene. The city has a huge range of quality cafes, bars, restaurants and clubs, from the bohemian to the sophisticated. As a shopping destination Glasgow is second only to London. You’ll be struck by the scale and outstanding collection of retailers – and what’s more, the city centre is compact and walkable. Enjoy the delights ‘in store’ at Buchanan Street, Princes Square and the Merchant City. Surrounding Glasgow is some of Scotland’s most beautiful scenery from the rolling hills of the Clyde valley to the wonderful walking country of East Dunbartonshire that borders the south west Highlands. There’s much of interest. Paisley is more than just the site of Glasgow International Airport, the major gateway into Scotland. The town has a fine Abbey and is home to the eponymous teardrop motif. Biggar is proclaimed as Scotland’s Museum Town as it has seven unusual and fascinating museum collections. Close to Lanark is the World Heritage Site of New Lanark Mills. Owned by the visionary Robert Owen, these cotton mills and the community they supported are a landmark in the history of social reform. It’s in an idyllic and peaceful setting close to the Falls of Clyde. North of Glasgow, in the shadow of the Campsie Fells, is the remains of the Roman Antonine Wall which stretched originally from the Firth of Clyde to the Firth of Forth. The famous Falkirk Wheel to the east of the area is a magnificent engineering feature of the world's only rotating boat lift and one of Scotland's 'must see' attractions alongwith the exciting new 30m high equine sculptures of the Kelpies beside the Forth and Clyde Canal. Of course, if you’re feeling fit, you could join the famous long distance walk, the West Highland Way. This begins at Milngavie and wends 95 miles north to Fort William through the spectacular landscape of the Southern Highlands.